Building bridges to the surrounding community is nothing new for Jon Appleby's family. His father has been selling free-range eggs to nearby shops, cafes and restaurants in Cheshire, England since the early 1960's. 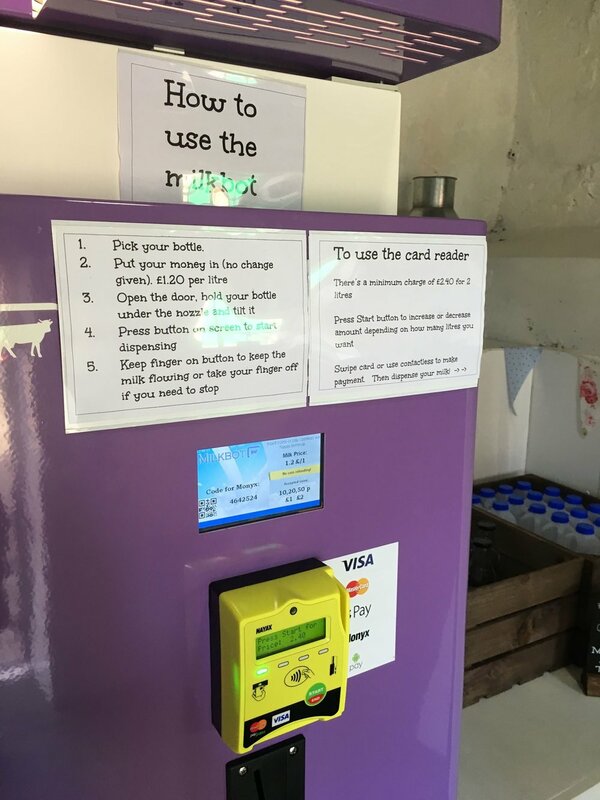 John has made the supply chain even shorter by installing a Milkbot vending machine selling raw, unpasteurised milk in February 2017. Now the family farm is attracting local people and more support than ever. One of their first customers was Olympian gold medalist hockey player Samantha Quek. The farm is licensed by The Food Standards Agency to sell the raw milk directly to the consumer. See: UK requirements for raw milk and cream - Food Standards Agency. The herd and the milk is tested every couple of months but on top of that Jon sends samples to the National Milk Laboratories, an attitude perhaps rooted in his scientific background. Jon, who is a former biology student at the University of Birmingham didn't want to be a farmer but decided to give it a go about 20 years ago. According to this article he says the greatest sight for him is seeing parents and kids walking into the farmyard to buy their eggs and milk from the local farm.